In this activity, you will be learn how to set up an Network File Share (NFS) and a Windows File Share (SMB). You will also have an activity involving Secure File Transfer Protocol (SFTP). So let’s get started! On the top menu, click Manage. On the “Before you begin screen”, click Next. On the Select installation type screen, ensure Role-based or feature-based installation is selected, and then click Next. On the Server selection screen, click Next. 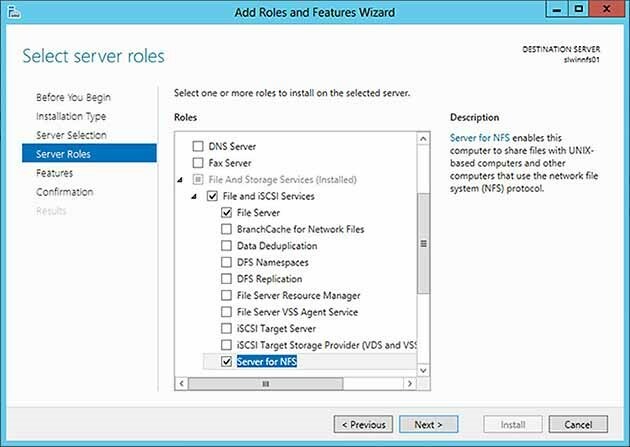 On the Select server roles screen, expand File and Storage Services, expand File and iSCSI Services, and then check the box next to Server for NFS. 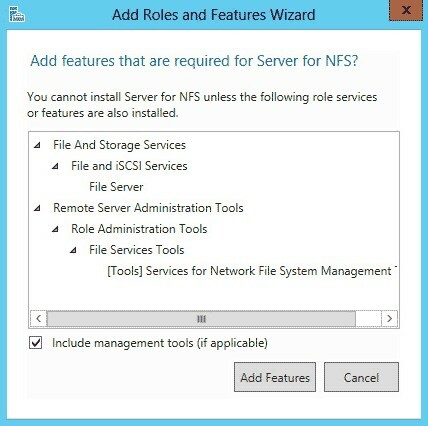 If an Add features that are required for Server NFS dialog box appears, click Add Features. On the Select feature screen, click Next. Confirm the installation details, and then click Install. Create a new directory for your NFS share. Right-click the directory and click Properties. Select the NFS Sharing tab. Enter a name into the Share name text field. This will be used when a user connects to your NFS share. Click Add and then enter the IP address or hostname of the client(s) you want to allow connections from. You may also give them different permissions. Add a line for each folder you wish to share. NOTE: If you share a folder, all subfolders will be shared as well. In that example the host 10.2.3.45 can mount my shared drive but they can read only (ro) while 10.2.3.32 can mount the shared drive but they can read and write (rw). (options) – there are a number of different options you can set here, though the ones you will most likely use most often are “ro” or “rw” standing for “read only” and “read write” respectively. You will need a new line like that for each directory you wish to share, but remember, all folders under that folder will be shared, so you will only need to share the parent directory if you want to share all sub-directories within it. Save the file when you are done adding lines. To make it take effect and start NFS, restart the machine. On the Select server roles screen, make sure the box next to File and Storage Services is checked. Open Server Manager and navigate to File and Storage Services. Once there, go to Shares and, from the Tasks menu, choose the New Share option. Select SMB Share, you can choose the any of the profiles. Next, click the bubble to Type a custom path and browse to the folder you wish to share. Pay attention to the Remote Path to Share. As that will be the path that people will use to connect to your share. In the next step you have a few extra options you can add in based on your needs. 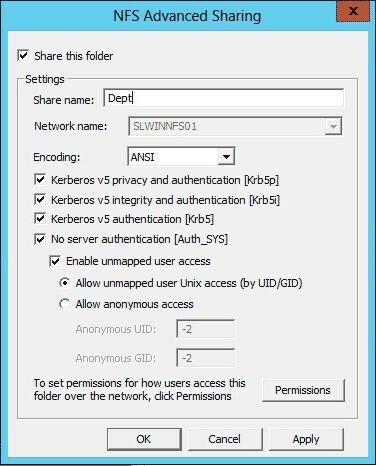 Next you will set up permissions for the share. Next, you will set up folder management properties. It will have you set things such as the purpose of the folder and the folder owner’s email. Next, you will set up a quota for the share, if you would like to set one up. This includes setting size limits and setting up alerts when the share is nearing the quota. Finally, review your settings and click Create to create the share. Now that you know how to make and connect to a couple different types of file shares, we are going to look at using SFTP. In order to set up SFTP on a Unix machine, you only need to have SSH working. SSH comes installed by default on most Unix distributions. The first line tells it that only users who are a part of the group “sftpusers” can access the machine through SSH. The second line “jails” the user to their home directory, meaning they can only access that directory and any sub-directories. This is optional and you can set the directory to whichever directory you wish. The third and final line that you add forces ssh to use its own sftp program. After doing this, you must add the group “sftpusers” and then add the users you want to have sftp access to that group. After completing that, you should be able to use SFTP to connect to and transfer files to and from this computer, but only using the credentials of the users in the group “sftpusers”. It may say that the host is unknown if this is the first time you have connected to the computer. Accept the host connection. Enter the password for the user on the remote computer and, if entered correctly, you will be connected. Download and use the program FileZilla. You should now be connected to your computer using SFTP.